When Keynes wanted to come up with an example of activity that enables an economy to flourish by requiring the investment of huge amounts of physical labour but without causing the failure of aggregate demand he suggested the Egyptian pyramids. Today, however, Egypt is providing a different kind of lesson that I hope the Egyptian people learn in time: that democracy and indebtedness are not compatible. Egypt is in the midst of negotiations with the US over the debt of its former regime. Such debt, which enriched Mubarak and his cronies, was one of the causes of the revolution and should now be reupdiated as odious and no longer the responsiblity of the citizens of the newly democratic Egypt. 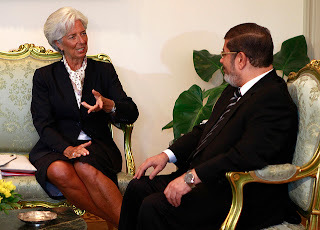 The presence of Christine Lagarde in Cairo offering 'loans' and 'partnership' suggest that this is unlikely to happen, and that Egypt will, like so many countries before it, lose its freedom to an entanglement of foreign debt. The process was begun as soon as Mubarak fell, as reported by Egyptian economist Noha el Shoki in March.